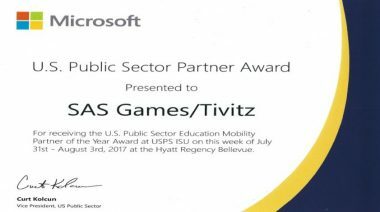 Seattle, WA.- TiViTz, a math and strategy game for students, has been named the 2017 Microsoft U.S. Public Sector Education Mobility Partner of the Year. The company was chosen from more than 100 organizations across the public sector divisions for demonstrating excellence in innovation and implementation of education technology. The Education Mobility award was presented by Curt Kolcun, vice president, Microsoft U.S. Public Sector, at the U.S. Public Sector Kickoff and Industry Solution University (ISU) event in Seattle. TiViTz motivates kids by pairing gaming with STEM. On mobile devices, at home, and in classrooms, the award-winning TiViTz math and strategy game sharpens math skills, encourages critical thinking, and is fun at the same time. Learn more at TiViTz.com.